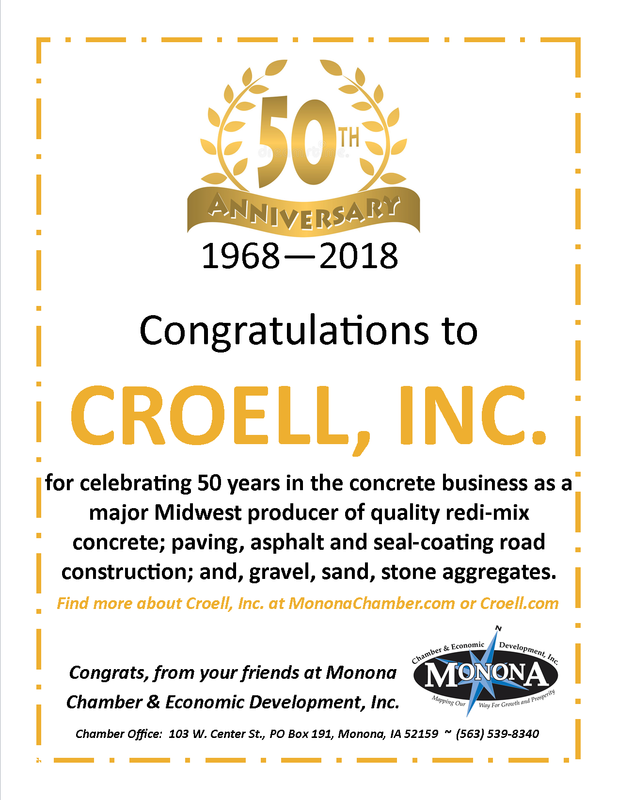 Croell Redi-Mix, Inc. - Monona Chamber & Economic Development, Inc.
​Richard and his Croell Redi-Mix, son, Roger Croell, built Croell Redi-Mix from the ground up, using concrete of course. They constructed the first plant in their hometown of Lawler, Iowa during the spring of 1968. 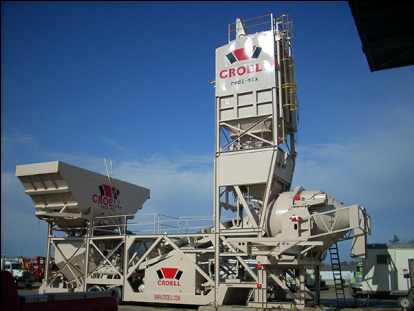 Croell Redi-Mix soon expanded into three locations, adding plants in Prairie du Chien and Sumner in the early 70s. It was during this time that we made Croell Redi-Mix a leader; focusing on the excellence of our concrete and our customer service. Today our company is in six different states with more than 130 locations. The expertise that was acquired in the beginning stages of Croell Redi-Mix has never been forgotten. Even though our company has expanded into several other companies to suit our various customers’ needs, our commitment to serving our customers is still our highest priority. Croell Redi-Mix Inc., a family owned, third-generation company provides quality concrete and exceptional customer service throughout our various locations in the Midwest. We continually strive to utilize high quality raw materials to provide the best concrete available. Our small town values of meeting the customer’s needs first and building long term customer relationships has not and will never change. Croell Redi-Mix Inc.: Striving to be the preferred concrete company in the United States and expand our locations to provide more services tailored to customer needs. We have over 130 locations in six states. Chances are pretty good there’s a Croell location near you! Ever since 1968, Croell Redi-Mix has been a producer of quality concrete, and we strive to be the best at what we do and never forget that our valued customers always come first. In addition to Redi-Mix, our product line includes paving, asphalt, seal coating, gravel, sand, and stone for commercial, residential, or do-it-yourself jobs. ﻿Croell is ready to help you "DO IT YOURSELF!" Visit our website or give us a call to learn more about how to get started with your own projects. We have available dozens of how-to guides from which to download for free from our website. There's nothing better than the satisfaction of completing a construction job on your own. Croell will help you with planning advice, costing out jobs, ordering Croell materials and supplies, installation tips, etc. Contact Monona Plant Manager Jason Cline (563) 539-2125 when you're ready to start your project! Click here to get quickly to a link listing our latest projects. This will show you our quality work, professional services & products, and what are customers tell others about us. ​Not all products are available in all locations. ​We strive to be recognized by our customers for providing the highest quality construction, safely and on time. We accomplish this goal by emphasizing education, training, planning, scheduling and continuous upgrading of our equipment, construction methods, technique, and productivity. Our continual emphasis is on the safety and well-being of our employees, and the satisfaction of our customers. ﻿GRAVEL is available as needed. We offer all types of SAND. Ready for a great job, great benefits, great career? 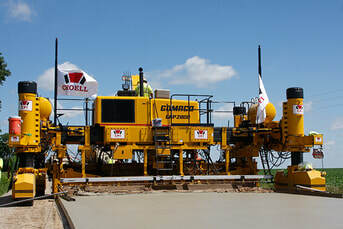 Croell Redi-Mix, Inc. is privately-held regional construction company with over 100 multi-state locations. We are a major producer of concrete and asphalt road construction in the Midwest & are currently looking for highly motivated, experienced and productive individuals to join our growing operations. We appreciate our team and understand they are the backbone to developing our family-owned business. If you are interested in advancing your career, then please take a look at our benefits and contact us with your job interest & qualifications.